Another book that came highly recommended by Swaram, and I was not one bit disappointed. Starting from the birth of Mehrunnisa, a child who was born into poverty, while her parents were on the road. Her birth heralded, in a lot of ways, a big change of fortune for her father, a Persian courtier who goes on to find a place in Emperor Akbar’s court. Mehrunnisa has a special place in her father’s heart, and she grows up to be an intelligent , astute young lady, who soon catches the eye of Empress Ruqaya, Akbar’s favourite queen. She is summoned to the zenana, and from then on, is a frequent visitor there. One day, she meets Salim, the crown prince. She is fascinated by him and longs to meet him again. But before that happens she gets engaged to an Afghan soldier. The Emperor has sanctioned the marriage and she had to go along with it, because nobody could go against him. Just days before her wedding, she catches Prince Salim’s eye again.This time, he is so enamoured by her that he tries to get his father to annul Mehrunnisa’s engagement, but it does not work. They both go their separate ways, Mehrunnisa, comes across lots of unhappiness and sadness in her marriage, while the Prince adds a few more wives to his harem and becomes the King – King Jahangir. Eventually, they do get married, and she goes on to become Nur Jahan(as she was popularly known), his most influential wife. Apparently she went on to become one of the most powerful queens, even by today’s standards. Mehrunnisa manages to capture Salim’s attention and manages to get what she wanted at an age where most women would be grandmothers in those days. Her years of unhappiness, her multiple miscarriages, the birth of her daughter(whom she adored), none of all this took away from her charms. 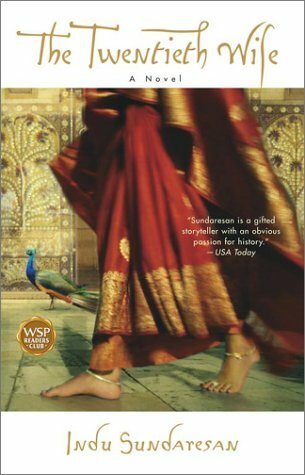 Indu Sundaresan’s words recreate the Mughal era beautifully.Right from the zenanas where political battles were fought, the lives of royal families, the Mina bazaar, to the emotions that seem to rule almost all the decisions that are taken. The power that was wielded by these veiled women, hidden away in the zenana is brilliantly portrayed. Emperor Akbar was expertly manipulated by Ruqayya, his favourite queen, while Salim(Jahangir) was controlled very effectively by Jagat Gosini, his most influential queen, until Mehrunnisa arrived on the scene. For a while,Jagat Gosini, even managed to convince Salim that Meherunnisa belonged to a family of traitors, and so was untrustworthy. Finally, Salim’s attraction towards Mehrunnisa is more powerful than everything else. If only they wrote history textbooks like this, I am sure I would have enjoyed history in school, far more. Having said that, I had some trouble coming to terms with their ‘romance’. From the very beginning, Salim comes across as a spoilt brat, someone who is used to getting things easy, surrounded by sycophants and women(including wives and slave girls). He was more interested in drinking and hunting and having a good time, than being a responsible king-to-be. For him to be attracted towards Mehrunnisa is easy to comprehend. Meherunnisa, on the other hand, is supposed to be smart and astute, so what did she see in a man who comes across as so weak? He tries to unseat his own father, gets swayed easily by the people around him and hardly ever interested in matters of governance. Mehrunnisa is shown badly affected by her father’s corruption, but Salim’s corruption, both moral and political, does not seem to bother her at all. Unless, it was less of a romance and more of a challenge for her, that she, a commoner could become a queen, if she wanted to. Or love is indeed blind! Either way, it is still a fascinating read and anybody who likes historical fiction, would love it. Just one more thought. Did you notice the cover? Doesn’t it look incongruous when the book is supposed to be a historical saga involving the Mughals? What do you think? The Twentieth Wife by Indu Sundaresan. Having said that, I had some trouble coming to terms with their ‘romance’. From the very beginning, Salim comes across as a spoilt brat, someone who is used to getting things easy, surrounded by sycophants and women(including wives and slave girls). He was more interested in drinking and hunting and having a good time, than being a responsible king-to-be. For him to be attracted towards Mehrunnisa is easy to comprehend. Meherunnisa, on the other hand, is supposed to be smart and astute, so what did she see in a man who comes across as so weak? He tries to unseat his own father, gets swayed easily by the people around him and hardly ever interested in matters of governance. Mehrunnisa is shown badly affected by her father’s corruption, but Salim’s corruption, both moral and political, does not seem to bother her at all. Unless, it was less of a romance and more of a challenge for her, that she, a commoner could become a queen, if she wanted to.Or love is indeed blind! Either way, it is still a fascinating read and anybody who likes historical fiction, would love it.